This article is about the 1968 film. For other uses, see Mayerling (disambiguation). 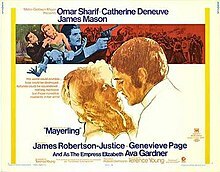 Mayerling is a 1968 romantic tragedy film starring Omar Sharif, Catherine Deneuve, James Mason, Ava Gardner, Geneviève Page, James Robertson Justice and Andréa Parisy. It was written and directed by Terence Young. The film was made by Les Films Corona and Winchester and distributed by Metro-Goldwyn-Mayer. It was based on the novels Mayerling by Claude Anet and L'Archiduc by Michel Arnold and the 1936 film Mayerling, directed by Anatole Litvak, which dealt with the real-life Mayerling Incident. Rudolf finds refuge from a loveless marriage with Princess Stéphanie (Parisy) by taking a mistress, Baroness Maria Vetsera (Deneuve). Their untimely death at Mayerling, the imperial family's hunting lodge, is cloaked in mystery, but the film's ending suggests the two lovers made a suicide pact when they decided they could not live in a world without love or prospects for peace. This page was last edited on 9 April 2019, at 14:28 (UTC).